The 2016 Fall Conference was a success. The AzPA wants to thank all of the attendees, conference speakers, the non-accredited lunch program sponsor Abbvie, and our exhibitors Pfizer and Tapi. Click here to see photos from the conference. Legislators are coming out to see all the creative and innovative ways our independent pharmacists are making their mark on our communities! 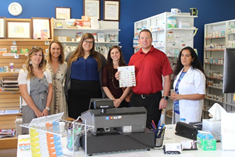 Local pharmacist and owner of SnS Pharmacy, Ashwin and his wife, Aparna, graciously welcomed Senator Jeff Dial and Representative Jill Norgaard to tour their pharmacy and talk about some of the successes as well as challenges of owning an independent pharmacy in Arizona. Our legislators want to hear from you! If you would like to host a pharmacy tour, please contact Erin at erin@azpharmacy.org to make sure your voice is heard at the state level. We are extremely grateful to all our members who have participated in these tours, you really are making a difference! The final webinar in the Virtual Learning Webinar Series for the Medication Summer Series: Reducing Adverse Events Related to High-Risk Medications is Wednesday, Sept. 28. Registration is free! For more information, click here. To register for the Medication Summer Series, click here.